The Very First Line From Last Sacrifice! If I'm correct, then this is actually our 100th post. :-) So then it's only fitting that this blog post is a really special one. Because today we got our first peek at Last Sacrifice! This is of course incredibly exciting, but as always, if you don't want to know anything about Last Sacrifice before you have the book in your hands, don't read on. Those of you who do read it, what is your opinion of it? What do you think it means? According to Blake this is the Romantic Times Book Reviews Magazine December issue if anyone wants to try and find it. 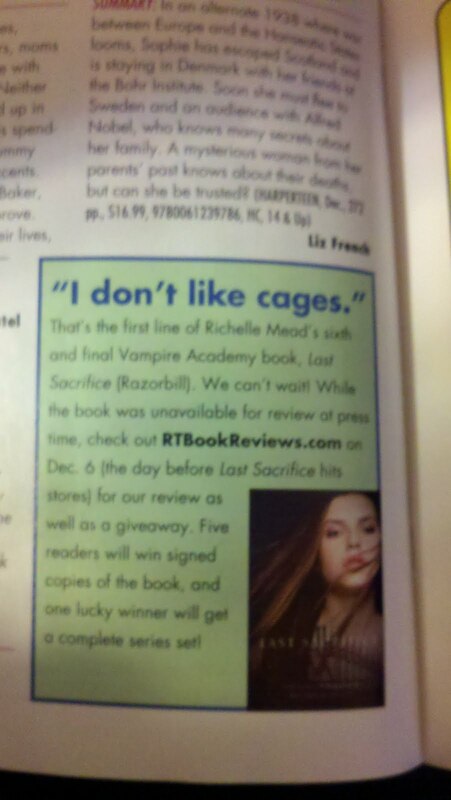 That's the first line of Richelle Mead's sixth and final Vampire Academy book, Last Sacrifice (Razorbill). We can't wait! While the book was unavailable for review at press time, check out RTBookReviews.com on Dec. 6 (the day before Last Sacrifice hits stores) for our review as well as a giveaway. Five readers will win signed copies of the book, and one lucky winner will get a complete series set! So this is something to write down in your calendars, so you don't forget to check their website on December 6! Although, again, fair warning for all who don't want to know anything about the book beforehand. Don't read any reviews either!